We love how this new Cinderella design turned out! 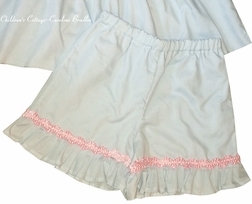 We use solid light blue fabric in keeping with the colors associated with Cinderella, and make either a dress or swing top and trousers. The bodice is made with pristine white fabric with the seam between it and the skirt portion embellished with pink with white dots ribbon ric rac. 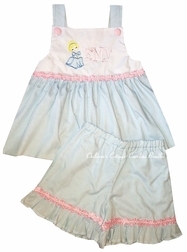 The bodice is appliqued with Cinderella sitting next to your little one's monogram. The shoulder straps fasten with covered buttons to match the ric rac color scheme. The trousers have ruffles below the ric rac.